For any company that generates hazardous waste in San Diego, it is imperative that a business follows the proper disposal of that waste. State and federal regulations are put into place to protect the environment and health of the public, and any company that disregards these laws may face serious hazardous waste violations. While San Diego County has detailed waste requirements for training, emergency preparedness and Hazardous Waste Disposal, here are examples of some of the most common violations in San Diego - and how you can avoid them. It is a company’s responsibility to determine whether it generates hazardous waste, and if so, whether that waste should be stored, disposed of or transported. A waste’s toxicity, reactivity, corrosivity and ignitability all factor into whether waste is hazardous. Inadequate identification of a waste - determining that it is not hazardous when in fact it is - is an easy way to face a waste violation in San Diego. Most companies are aware whether the waste they generate is hazardous because of the process and materials that are used to create the waste. Some waste, however, may need further analysis if there is uncertainty. To avoid a violation, a certified laboratory must conduct any analysis using specified procedures. The San Diego Department of Environmental Health-Hazardous Materials Division also has a guide available that can assist in making this determination. It’s also important to note that California follows a Universal Waste Rule that states all universal wastes are considered hazardous wastes. That means even if you are not a business that regularly generates hazardous waste, you must still follow this regulation. The Universal Waste Rule addresses common wastes generated by a wide variety of people. This means everyday items found in offices, such as TVs, computers, batteries and fluorescent tubes, are considered hazardous wastes and must be disposed of properly. Not doing so can result in a violation and fine. For more guidance on how to dispose of these items, read our article, Why It’s Important To Dispose Of E-waste Properly. Any business that is considered a large quantity generator must also maintain training records with specific details included at the facility, or face a violation. One of the most frequent violations is when a company does not properly label a hazardous waste container. 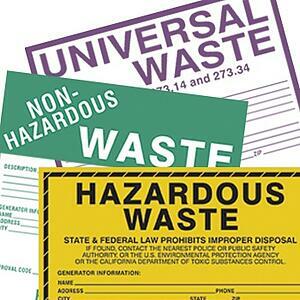 Regulations for hazardous waste disposal require specific information be included on labels. These labels also must be clearly visible. In addition to mislabeled or unlabeled containers, companies can get fined for improper storage areas as well. Properly storing hazardous wastes is critically important to minimize the potential for and seriousness of an incident. Hazardous materials must be disposed of at a state-permitted facility. Improper disposal can cause hazardous waste to seep into the ground, affecting a population’s health and the environment. Because of this threat, businesses must have an industrial waste discharge pre treatment permit that allows waste to be dumped into a sewer system. This permit verifies that any hazardous waste is properly treated before being discharged. Without a permit, San Diego companies that are hazardous waste generators must comply with the other rigorous state and federal regulations. Failing to properly do so can results in thousands of dollars in penalties per day. However, working with a company certified in handling and disposing of hazardous waste can ensure your company meets these regulations. It can be more economical as well, considering using a certified company also can free employees from the rigors of time-consuming hazardous waste management. To learn more about what to look for in a hazardous waste disposal vendor, you can read our article 5 Tips For Choosing The Right Hazardous Waste Vendor.